New Holland is global brand of agricultural and construction machinery produced by CNH Global. New Holland agricultural products include tractors, combine harvesters, balers, forage harvesters, self-propelled sprayers, haying tools, seeding equipment, hobby tractors, utility vehicles and implements, as well as grape harvesters. 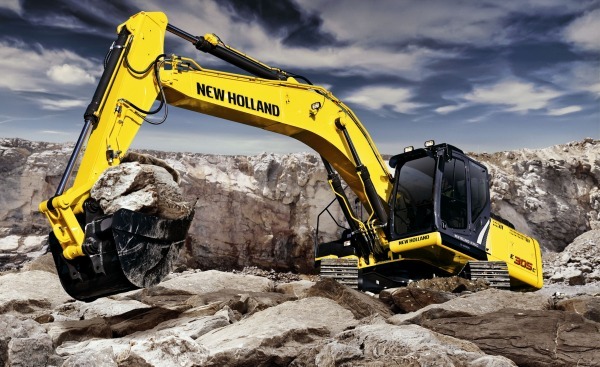 New Holland construction products include dozers, mini excavators, graders, wheel loaders, crawler excavators, backhoe loaders, telehandlers, and skid steer loaders. But even the finest piece of equipment will need service, repair, and regular maintenance. A factory New Holland Service Manual is the only real choice. The original free New Holland operators manual is helpful for becoming familiar with the operation and minor maintenance of your New Holland Tractor. But, an authentic New Holland Tractor service manual is a must-have item for both the professional and the do-it-yourself mechanic. You already know this if you are the person responsible for repairing New Holland equipment for a shop, farm, or construction site. The original NEW HOLLAND MACHINE COMPANY was founded in 1895 in New Holland, Pennsylvania; it was acquired by Sperry Corporation in the 1970s, then by Ford Motor Company in 1986, and then by Fiat in 1991, becoming a full line producer. In 2005, the New Holland Construction Brand was created with a global full-line product offering. Since 1999, New Holland is a brand of CNH Global. Through this consolidation, New Holland is now able to provide professional service manuals that contain detailed instruction on the major repair components of your New Holland equipment. Illustrated diagrams are used throughout these New Holland service manuals. Diagnostic, test, adjustment, theory of operation, and repair information are all explored in detailed illustrations. New Holland equipment is manufactured all around the world; the current administrative headquarters are in Turin, Italy, with New Holland, Pennsylvania serving as the headquarters for North America and home of the largest hay tools production facility in the world. With 18 plants spread globally, as well as six joint ventures in the Americas, Asia and Middle East, the corporation is present in 170 countries worldwide. Due to that worldwide reach of New Holland Tractors, it is feasible to offer customers the ability to download and receive their New Holland Manual immediately. The New Holland Service Manuals we have available online here are the finest standard reference for all New Holland tractor repairs. The Technical Service Manual is an extremely clear and highly detailed manual, originally designed for the Shop Mechanics at the New Holland dealer. With every repair manual containing between 500 and 900 pages, it only makes sense that this authentic factory Service Manual will pay for itself several times over the very first time you even look at it. Most Internet websites and Technical Service Publications refer to these exact service manuals when answering technical questions in forums and articles. Every conceivable technical “how to” question is answered and explained. It is the finest and most up-to-date New Holland workshop manual reference available. This New Holland Service Manual is a “must have” for every machine, including…. Would you like to see the quality of an online New Holland Manual? We have a free sample available online for download! CLICK HERE to download the New Holland TN75 Tractor complete service manual. You will see how easy it is to download. Then see how easily it can be viewed on any computer, as well as zoomed and printed. You can print out the entire manual, or most mechanics like to print out just the sections they need at the moment. The paper will probably get ruined anyway, so just throw it away when your work is complete! Search for your specific New Holland Tractor Service Manual now by typing in the model in the search box at the top of the page. It’s really that easy!